That's the 1990 US Mysterious Press hardback first edition/printing of Drowned Hopes, the seventh Dortmunder novel, with a dustjacket design by Harold Nolan. After scoring a UK hardback first edition of the previous Dortmunder novel, Good Behaviour, I had to switch back to US first editions for this one, as there was no UK hardback of Drowned Hopes – nor indeed of the next couple of Dortmunders. 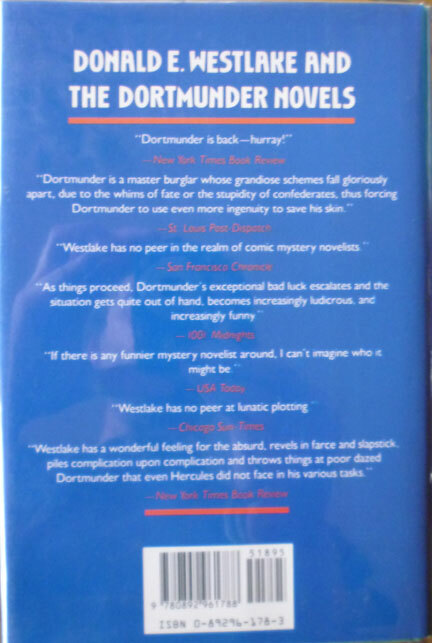 Seems British Westlake fans were rather ill-served in the 1990s; must've been a bit frustrating for anyone in the UK trying to keep up with Dortmunder and crew's adventures. In fact I don't think Drowned Hopes saw publication in the UK until 2008, when Quercus issued it as a paperback (I may be wrong there though). Anyway, unlike most of the second-hand books I buy, where I generally have little to no idea who might've owned a book previously, this time I know a bit of this book's history. According to the dealer I bought it from, it was part of a Westlake and wider crime/mystery collection assembled by American TV writer and producer Frank Lupo, creator of, amongst others, The A-Team. 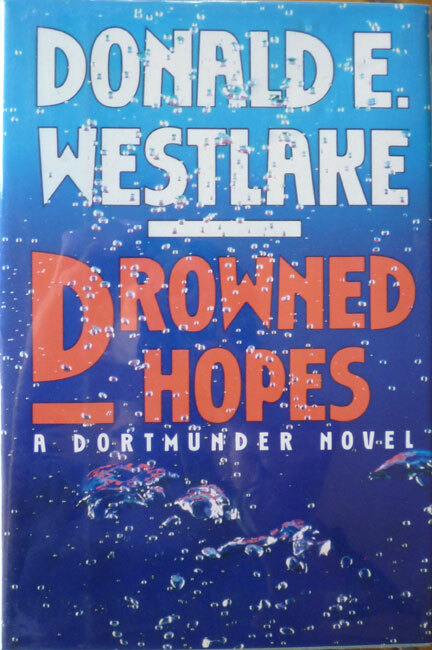 I only have the dealer's word on this of course, but this copy of Drowned Hopes is certainly in remarkably fine condition (and at over 400 pages, I think the longest Westlake novel I own). So if it did indeed belong to Mr. Lupo, all I can say is, thanks for keeping it in such great condition, Frank. And rest assured I'll look after it. Wow would I have loved to have seen that collection in its entirety. My copy, same version as yours, purchased sight unseen on eBay, was waterlogged and dried out before I bought it. Like maybe it was buried with all that money at the bottom of the reservoir in the book. That's what I tell myself when I look at it on the shelf. It may be the lousiest looking book I own. I desperately needed a copy to read and it was the only one available at the time. And I may be wrong but I think (possible spoiler) this is the first Dortmunder book where somebody dies. Also - I read this Westlake Score on via wifi on my iPod at a federal courthouse and their filtering software promptly banned access to your page. Quite right too. Clearly this blog is a corrupting influence. Hoes does it work with American jury duty? Do you have to hang around, waiting to be picked for a case, like you do over here? For federal jury duty in the District of Columbia, you are on call for two weeks. Some days they call you in, others, not. You have to stay in the jury pool until you get picked for a trial or until your time runs out. So you can end up sitting around all day for several days. After we completed voir dire and waited for them to pick a jury (about six hours), the defendant decided to plead guilty (to stealing cell phones from the Federal Reserve and selling the phones and/or airtime to people - not a Parker caper - more like something Andy Kelp would be involved in). So we were dismissed and thrown back into the jury pool. And now we are waiting to start all over. DC is the smallest federal court and has a very high case load - I think federal jury service is far less onerous everywhere else. If you get called for DC court (local), it is one day or one trial. And sometimes you get called to serve on a Grand Jury - they can keep you for 25 days. To summarize: Stay in the UK. I was a super-citizen today as I did jury duty in the morning and voted in our primary elections in the evening. Preserved for posterity by the British Library's UK Web Archive. Lewes Book Bargains: Two by Amis M.
80s Comics Cavalcade: Detective Comics #526; the Best Batman Comic Ever? Was Agatha Christie Anti-Semitic? Well, Was She? Belated Reminder: A Westlake classic, Traveling once more. The Yellow Earl: In His Own Words. A Lost Interview Rediscovered! Purrkin the Talking Cat by Josef Lada. Copyright © 2007–2018 Nick Jones. All rights reserved. Ethereal theme. Powered by Blogger.